Throughout the course of September's Charrette, vignettes were produced to illustrate the potential solutions, possibilities, and opportunities in Thomasville. These vignettes are DRAFTS that show a before and after progression for a variety of sites throughout the City and while they may show one location, they are intended to serve as a template for other potential sites within Thomasville. It is important to note that while the development scenarios depicted are intended to be persuasive, the illustrations are conceptual, not regulatory. They depict one potential outcome and are based on statements heard from the public during the Charrette. Other possibilities exist and will continue to be explored. Check out the vignettes from the Charrette below. These ideas under construction will continue to be refined and studied as the Comprehensive Plan is written. How can we accomplish commercial revitalization using bike infrastructure? Today, Clay Street serves cars above all else. There is excess pavement, speeding cars, and vacant neighborhood commercial buildings where Clay meets Mitchell Street. This creates an environment that is unsafe and unwelcoming for pedestrians who are using the park. In the future, Clay Street is envisioned as a bike-priority corridor that will connect the multi-use trail running along McIntyre Park to downtown. To accomplish this, upgraded sidewalks and crosswalks are added and high quality protected bike facilities are introduced, reducing the pavement for cars and slowing them down as well. There is also an opportunity to revitalize the existing commercial buildings, which are uniquely located to serve the community around Clay Street and those visiting the park. What could a city gateway look like? West Jackson Street is one of the primary entrances into Thomasville. While improvements have been made and are being made to portions of West Jackson close to downtown, there is an opportunity to improve this corridor up to Patten Street and beyond to better serve more residents in the area and create a more pleasant experience for those driving into Thomasville. Suggested improvements include burying power lines, reducing five lanes of vehicular traffic down to three, adding formal on-street parking, street trees, and protected bicycle lanes. These public improvements can in turn help spur commercial and residential infill development in vacant parcels, as well as encouraging the revitalization of the beloved Imperial Hotel, Thomasville’s only historically African American-owned hotel. Behind Broad Street (which is about as beautiful a main street as one can find in America) are many streets that are less beautiful. A Downtown can support more than one main street and a few connecting streets. A Downtown implies many blocks of great streets. The corner of Jefferson and Crawford Streets could make an excellent location for a Downtown Hotel or, at least, several “main street style” buildings. Presently that block contains an important surface parking lot. This sequence recommends a mid-block, low-level parking garage hidden behind the hotel that triples the parking unobtrusively, while allowing Jackson Street to become a great street. How might neighborhoods be revitalized? It’s natural for a town to focus on its Downtown first, it’s the place everyone in the town has in common. Downtowns see investment in streets, public spaces, and buildings and then, invariably, and understandably, residents say “Bring some of that investment to my neighborhood.” This is not to say that towns aren’t always working on everywhere, they are, but even still, noticeable investment in neighborhoods that is as high quality as the investments in the Downtown bring towns together. Lester Street is an important neighborhood street. It needs resurfacing and dedicated sidewalks, street trees to shade pedestrians and add to property values, new homes infilling between existing homes in the form of for-profit and non-profit development, and façade improvements to historic structures. Lester Street needs an organized constituency dedicated to that street that works with the town to find public funds, and attract new investment. This series of images illustrates how several small, temporary interventions can transform a blank wall and vacant lot in the Creative District into a location showcasing the work of local artists and supplementing events at the Amphitheatre. The large expanse of blank wall is utilized as a canvas for murals by local artists, informing passersby that they are within the Creative District. Food trucks and seating can be located on the adjacent vacant lot to provide refreshments and complement events held at the Amphitheatre. These temporary uses can occur at this and similar sites throughout the Creative District to give life to otherwise unused spaces as they await future development. What could public housing look like? The existing design for public housing shows a block that is made up of three different building types arranged on the site. While it is nice that small public green spaces are established between the buildings, there is virtually no variation and the buildings are monotonous. These vignettes show how buildings could be renovated, or how the public housing could be redesigned in a way that does not displace citizens, but rather improve the quality of life for those who live in and around the community. One option shows what could be possible if some of the existing structures are replaced with houses that look like the houses in the neighborhood. Live/work units are included to help residents start their own business, a neighborhood resource center, pool, diner/café, and garden are built to create places for the community to gather and grow. Pavilions that could be rented out for parties, or events are included. The second option shows a reorganized block that shifts the green space to the corner with a neighborhood resource center. The pool, diner/café, pavilions, and community garden are included. All of the public housing is designed to look like the housing in the neighborhood with single family, multi-family, and live/work dwellings. How can we highlight signature spaces? While the heart of Broad Street is a beautiful central gathering place for Thomasville, the entry approach to this signature public space could be improved with a series of enhancements over time. These include: a more continuous canopy of shade trees along sidewalks, a well-placed focal feature in the center of the street to add civic beauty and traffic-calming, sensitively-scaled and designed street-oriented infill development, and additional small pocket parks. What could the Roses site be? Redevelopment of the site of the former Roses store, nestled between several important local historic districts, presents an opportunity to help reconnect this portion of Thomasville. The site is large enough to accommodate a wide range of uses and building types. Any design configuration should feature street-oriented buildings which respect the scale and character of the surrounding historic neighborhoods and help complete Thomasville’s network of high quality public spaces. Respondents wrote the words that came to mind when thinking about Thomasville "Now" and "In the Future"
The Word Cloud creates guidance for the plan and was generated from the results of an exercise conducted at the Hands-on Session, involving over 150 people. 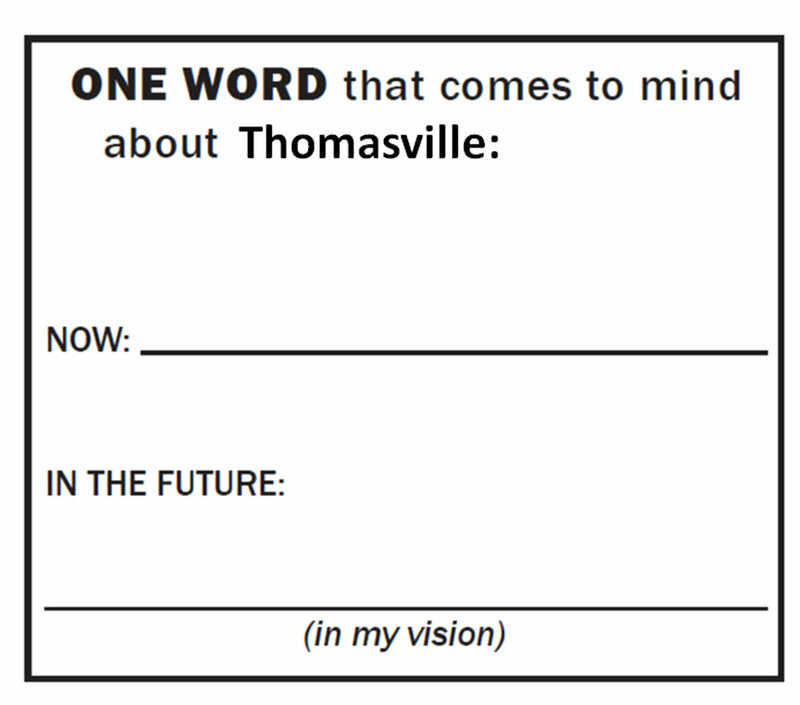 Participants simply wrote down one word that came to mind about Thomasville in “Now” and “In the Future.” The more respondents used a word, the larger that word appeared. In one word, respondents described Thomasville “Now” as “disconnected,” community,” and “historic.” In one word, respondents described Thomasville “In the Future” as “vibrant,” modern,” “community,” “opportunity,” “inclusive,” and “connected.” Other words were used and they are all important, but one can imagine a mission statement being written based on the words used the most often. Community members filled the room at 227 West Jackson Street. The consultant team presented subjects such as economic opportunity at the Work in Progress presentation. Thank you to all who came out for the Thomasville, Blueprint: 2028 charrette events last week! The energy from the community was fantastic and so many ideas were gathered to be incorporated into the Comprehensive Plan. The community really engaged this process, and as a result of the input, ensured that the Plan reflects the collective vision for the future of Thomasville – it could not have been done without you. Last Friday night, the consultant team presented the culmination of the work over the charrette to a packed room at 227 West Jackson Street. The themes heard from the community and potential concepts were presented as a rough draft of the direction for the Plan. These themes included: build truly great streets, maximize connectivity, expand housing options, grow and attract but protect and enhance character, and a prosperous and inclusive city. Specialists discussed opportunities for Thomasville and covered subjects such as: economic opportunity, urban revitalization for downtown and neighborhood centers, housing, health, historic preservation, urban character zones, sustainability, parks, transportation and mobility, and public housing. Renderings were presented to illustrate what the potential options for the future of Thomasville might look like based on the feedback and thoughts from the community. Concepts were presented based on feedback from the community. Housing options and affordability were discussed at the Work in Progress presentation. The consultant team then departed Thomasville to continue working on the draft of the Comprehensive Plan to be completed before the end of the year. If you couldn’t make the final presentation, don’t worry – it has been posted on the “Resources” page of blueprintthomasville.org and videos will be uploaded on the “Films” page. Keep checking in to learn about progress and the different subjects that are being discussed as the Plan is refined! Community members filled the room at the Open House on September 21 to see concepts and ideas for the Thomasville Comprehensive Plan. A great, energetic crowd came out last night for the Open House presentation at 227 West Jackson Street. They saw the work that has been produced to incorporate your ideas into the vision for Thomasville. Different stations were set up to gather feedback on the direction of the future vision for Thomasville. The consultant team hung maps, surveys, conceptual sketches, and had multiple PowerPoint presentations at different stations to discuss the various ideas for the Comprehensive Plan. These stations covered subjects such as Historic Preservation, a Synthesis Plan from the Kickoff Meeting, Transportation, Housing, Health, concepts for the Douglass School site, Economic Opportunity, Mobility and Commercial Revitalization, Sustainability, Public Housing, CityDesign, Neighborhood Character, and the Roses Site. The consultant team gathered more information through discussions at the various stations. This informal presentation made it possible for the consultant team to get feedback, learn more about concerns, and discuss these ideas with members of the community. Conversations identified even more thoughts and ideas to be incorporated into the vision for the future of Thomasville. The evening wrapped up with a quick poll of thoughts on the conceptual sketches of the Roses Site. The week-long effort culminates in the Work-In-Progress presentation Tonight from 6-8 pm at 227 West Jackson Street. After the presentation, visit the Amphitheater to view these ideas at various stations. Come on out and see how the ideas from the community have been incorporated into the vision and goals for the future of Thomasville! Yesterday was the first day of the Open Studio and Technical Meetings for Thomasville: Blueprint 2028 at 225 and 227 West Jackson Street. The consultant team heard from community members, business owners, and city leadership. Thoughtful groups come out and provided valuable feedback and ideas at the technical meetings like at the Economic Development Meeting. Great thoughts and feedback were gathered at the technical meetings that talked about economic opportunities, historic preservation, and sustainability for Thomasville. These meetings were held in a round table fashion and the ideas and concerns were noted and will become integrated into the Comprehensive Plan. Victor Dover presented strategies for creating great streets in cities and towns in the evening at the Library. Don't worry if you couldn't make this presentation or want to see it again, it will be posted online for you to view. Community members at the Historic Preservation technical meeting discussed ways to promote the diverse history of Thomasville. The Open Studio was also busy with activity as the consultant team worked on solutions to the ideas from the Kickoff Meeting. Groups filtered in and out of the studio space and included community members, business owners, and high school students. More ideas were gathered and discussed to help refine the plan and included future land use planning, urban design, bike lanes, business development, public housing solutions, housing and health, educational and vocational training opportunities, and redevelopment possibilities. Don't forget to come out to the Open House tomorrow at 6 pm and the Work-In-Progress Presentation Friday at 6 pm at 227 West Jackson Street. Come out and visit - see what is being worked on and give your thoughts. This is your chance to shape the vision for the future of Thomasville! Work continues on Thomasville: Blueprint 2028, the City of Thomasville’s comprehensive plan and engagement process, based on feedback received from a series of open houses in early May. Four open house sessions were held in various locations to accommodate and appeal to a large part of the community. Sessions were held at the City of Thomasville Council Chambers, First Missionary Baptist Church, Thomasville Community Resource Center, and Douglass School. Gathering thoughts and feedback at open houses. Nightly open house sessions incorporated the information gathered by the consulting team earlier in the day. “We began with a presentation on what we observed earlier that day and set-up a number of exercises to allow for input on issues that affect all of us, from the type and cost of housing to the quality of our parks, recreation, and streets,” said Herrmann. Comprehensive plan events with opportunities for public input will be scheduled throughout the year, with plans to present a draft to the community next Spring. Herrmann anticipates adopting the comprehensive plan early next Summer. For more information, visit Thomasville.org/comprehensive-plan or contact City Planner Brian Herrmann at (229) 227-7009.